Panguingue - thanoscardgamess jimdo page! 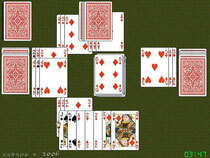 Panguingue, also known as Pan for short, is a Rummy game which is popular in the southwest USA. From four to eight players can take part in one game. It is played with eight decks of standard cards from which the 8's, 9's and 10's have been removed - 320 cards altogether. The game of Panguingue and its name may well have originated in the Philippines.